1. Introduction; 2. The English economy in the Longue Duree; 3. A historiography of the first Industrial Revolution; 4. Slave-based commodity production and the growth of Atlantic commerce; 5. Britain and the supply of African slave labor to the Americas; 6. The Atlantic slave economy and English shipping; 7. The Atlantic slave economy and the development of financial institutions; 8. 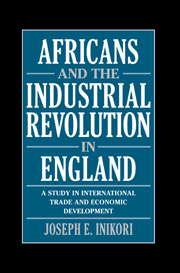 African-produced raw materials and industrial production in England; 9. Atlantic markets and the development of the major manufacturing sectors in England's industrialization; 10. Conclusion.